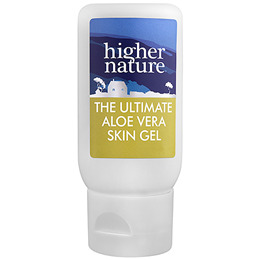 The Ultimate Aloe Vera Skin Gel is a high potency Aloe gel. While some companies add a mere trace of Aloe, the Ultimate Aloe Vera Skin Gel is made with pure, whole leaf, organically grown Aloe, with not a drop of water added. In addition Higher Nature triple-concentrate it, to give you 3 times as much, for a superb beauty treatment. The Ultimate Aloe Vera Skin Gel can be used after shaving and on wet hair and scalp. You can also rub it into tired muscles, after sports or gardening. Suitable for most skin types including problem skin. Aloe barbadensis (organic whole leaf aloe vera), glycerine, xanthan gum, natural preservative: potassium sorbate; dl-panthenol, tocopheryl acetate, chamomilla recutita extract (chamomile), allantoin, retinyl palmitate, niacinamide, citric acid. For healthy skin: Apply to stretch marks, chapped, dry and sensitive skin, and after sun bathing. For hair and scalp health: Apply 5ml evenly to wet hair and scalp. Below are reviews of The Ultimate Aloe Vera Skin Gel - 75ml by bodykind customers. If you have tried this product we'd love to hear what you think so please leave a review. I use this all the time, I have very sensitive skin it doesn't irritate at all, leaves skin soft & soothed, wouldn't be with out it. Was told to use Aloe Vera on the skin after radiotherapy.After doing some research I decided to buy this for the high Aloe Vera content. I was not disappointed,it cooled the skin and reduced the redness, within days of applying. I found it soaked into the skin and was not sticky like some of the cheaper ones I tried. Would definitely and without hesitation buy again. The Ultimate Aloe Vera Skin Gel is a high potency Aloe gel made with pure, whole leaf, organically grown Aloe. In addition Higher Nature triple-concentrate it, to give you 3 times as much, for a superb beauty treatment.